The Peoples Democratic Party has said there are signs that the 2019 elections may lack credibility. Apart from this, the opposition party said the ruling All Progressives Congress administration was not ready to conduct free, fair and credible elections. The National Chairman of the PDP, Prince Uche Secondus, stated this in Abuja on Wednesday while playing host to a United Nations delegation which paid him a courtesy visit at the party’s national secretariat. 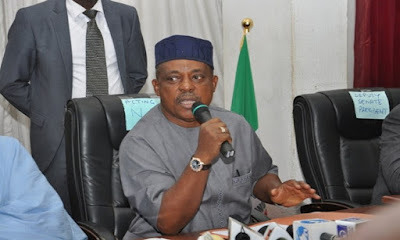 Speaking with the delegation, Secondus said the conduct of elections by the Independent National Electoral Commission since President Muhammadu Buhari assumed office had shown that the 2019 polls might not be credible. He said the majority of the elections conducted since the PDP left office in 2015 had ended up in reruns, adding that this was an indication that the commission was not ready to do the biddings of the electorate. Secondus alleged that most of the reruns were as a result of the unpopularity of the APC, but regretted that even at that, the ruling party was usually bent on winning the elections. He said, “We were in power as a party for 16 years to be precise, we deepened democracy with our actions. In the last general elections of 2015, we lost and conceded defeat, without attempting to go to court. “It is the first time that a party and its candidate would decide not to contest the outcome of an election in this country. It has never happened in this country. We did not go to court and our candidate did not go to court as well. “We realised and decided that the outcome was democracy in action and that it was the will of the people. Secondus also chided INEC for allegedly performing below the expectations of Nigerians in the past couple of years. He said, “As a matter of fact, this (INEC) is the only electoral body that has conducted elections several times and they (government) will call for a rerun when it is not in their favour. “I, therefore, want the delegation to look seriously in the area of free and fair elections that guarantee security. The Leader of the UN delegation, Mr. Serge Kubwimana, said the team was in the country on a need assessment mission, adding that the team would take input from political institutions in Nigeria in order to determine the thematic areas of possible assistance to INEC as the 2019 elections drew closer. He said, “This mission has been deployed from the UN headquarters in New York city. It is a mission that has been deployed in response to request on electoral system from the chairperson of INEC. “And the way we do it in the UN, in order to determine the areas of support, we conduct this type of mission and the overall context in which the election is taking place — the political violence, security and the like, the legal framework, the capacity and the needs of the electoral management body. Kubwimana said the UN was only interested in free, fair and credible elections, adding that the organisation still respected the sovereignty of the country.